This past December eHouse Studio had the amazing opportunity to give back to our community in the best way we knew how. We, at eHouse Studio, put our "digital" skills to the test and redesigned the Charleston Elves' website. So when the organization behind Charleston Elves, Courageous Kidz, had a need, there was no way we were going to pass up another great opportunity to pay it forward! Courageous Kidz often looks to the community for any donations in order to achieve this goal of helping cancer patient's families. What makes these Kidz so Courageous? Courageous Kidz began as a way to give children who were affected by cancer an opportunity to take part in fun activities and adventures throughout the calendar year, in hopes that maybe for a little while they would be able to forget about their cares and problems. Courageous Kidz's goal is to provide a "family-friendly environment where everyone understands these children's problems, where no one asks questions, where these children can be wonderfully normal." This organization attempts to give these kids a healthy, normal life, in contrast to the sterile, cold hospital life they must grow so accustomed to in their fight against this horrible disease. Our team at eHouse Studio wanted to swoop in to help in any way we could. In addition to helping children get through this courageous fight, Courageous Kidz also tries to provide their families with monetary help to alleviate the extra financial burden they must bear. Courageous Kidz often looks to the community for any donations in order to achieve this goal of helping cancer patient's families. How is eHouse joining the cause? Every year Courageous Kidz sends approximately 100 children with cancer, their siblings, counselors and medical staff on a fun-filled, three day "adventure" of "fun, food, and frivolity" at Carowinds and a day of tubing at the lake. In order to make this trip become a reality, Courageous Kidz is looking for donations! Our team at eHouse Studio wanted to swoop in to help in any way we could. 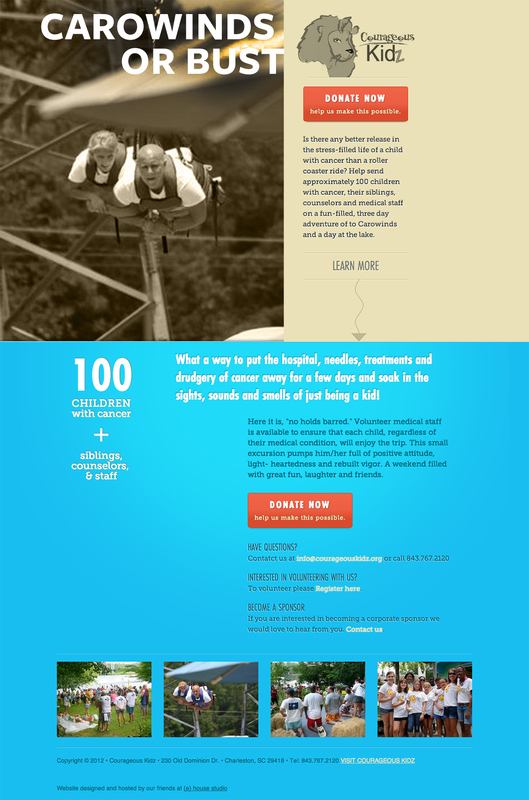 In an effort to help Courageous Kidz, eHouse Studio is launching a donation landing page that offers those who are willing and able to donate money the opportunity to help take these kids to Carowinds. In addition to a landing page, we have also created an email to be sent to everyone on our list in hopes that even if the recipient might not be able to help with a monetary donation, they will then forward it to all of their friends! How can YOU join us in our efforts? Check out our landing page and please donate if you can! Get others to check out our landing page and donate if they can! And at least, please forward our email to everyone in your address book. We at eHouse are really excited to be helping such a great organization. Keep posted as we hope our efforts, combined with yours, will send these Courageous Kidz to Carowinds! Visit Carowinds or Bust for more information.